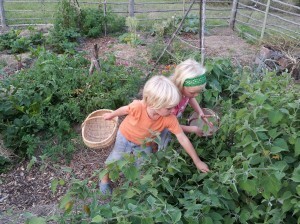 Home » Reasons to grow your own veggies – and eat home grown on holiday too! This entry was posted in Eco Lifestyle and tagged children and nutrition eating fresh food on holiday home grown organic holidays organic vegetables on October 21, 2013 by Rhian. I always dreamt of having a veggie garden where the vegetables would tower over my children as they walked down the paths, enticing them with a smorgasbord of flavours and smells. And there really is a lot of power in the mantra of choosing the life you would like to lead. Although my children are growing rapidly and the new veggie garden is not as yet towering over them I still garner such satisfaction from watching my fussy ‘I-don’t-eat-vegetables’ 4-year-old picking fresh mange tout by the handfuls and happily crunching all their sweet nutritious goodness right there in the garden. My reasons for wanting to leave the city with my first-born and lead a simple country life with an emphasis on fresh air, open spaces and healthy living are coming to fruition and I’m realising that we’re living the life I’ve chosen and dreamt of. But, I hear you say, you don’t live in the country, so how can you grow vegetables? Well you can grow them on a stoep in a high rise flat, all you need is a few containers and a sunny spot. And, if you remember your school biology, all the plants will need to grow is good soil (preferably enriched with your own home made fertiliser from your earthworm farm), sunlight and water, and what they didn’t mention in biology was that plants thrive on a whole lot of love. So whether you live in a flat or a sprawling suburban home, growing your own veggies in the city is all about your choice to do so. And the benefits to your family in terms of nutrition and less exposure to pesticides will be phenomenal. Not to mention the fact that you’ll be doing your bit for the planet by not supporting the pesticide infused agricultural system which takes its toll on local ecosystems. So what are you waiting for, go dig out those old gardening gloves and try out your green fingers. The reality is, though, that we don’t always eat at home, what about when we are on holiday or eating out, how can we ensure that we’re getting the freshest and most nutritious food. Luckily, there are establishments around the country that have committed to growing organic food not only for themselves, but for their guests too. Let’s take a quick tour from Gansbaai to Hoedspruit for a virtual visit with some veggie growing guest houses. Farm 215 is a private nature reserve in an undisturbed valley between Stanford and Cape Agulhas in the Overberg. In the reserve is a small-scale sustainable and strictly laid-back guesthouse offering tranquility and an overpowering sense of space. And besides their many ethical practices which include planting trees for tourism and empowering the local community, guests will also be treated to fresh organic produce grown right there on Farm 215. Sounds to me like a truly healthy break from the city. Further up the coast in the heart of the Garden Route is Fynbos Ridge Private Nature Reserve with a guest house and self-catering cottages set in the fragrant fynbos and spectacular views of the Tsitsikamma mountains. Delicious dining and alfresco breakfasts are available or they invite you to pick your very own salad from their organic vegetable garden. A holiday treat that is indeed good for the body and soul, to be enjoyed with a clear conscience. And from there we skip straight to the bushveld where you will find Garonga Safari Camp, an eco friendly oasis for the discerning visitor. Situated in the greater Makalali Conservancy west of the Kruger National Park, this unassuming sanctuary promises an intimate wildlife encounter in an unhurried environment where you can unwind, sleep deeply and be yourself. And yes, you better believe it, they too grow their own organic vegetables in that dark red soil and serve the bounty to all their guests. With Spring finally in the air may you feel inspired to grow your own food, eat your own food and support the places that do the same. Exactly! Thanks for great article. Although I only started growing veggies after my kids left home, I just love not having to buy lettuce, spinach, strawberries, beans, peas. All so easy to grow. Best of all is knowing there are no pesticides on them at all. I think that all veggie gardeners should also be vermi-composting. ( I love that compost- and new veggies just grow out of it, without having to add seeds. I have had to weed out 1000’s of tomato seedlings- but still worth it..) It is best therapy too. The rat race is not worth giving up good healthy food. Did you try again and have better luck in loading this blog? I do hope so! Let me know how it went.